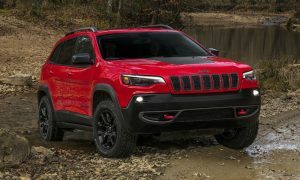 2019 Jeep Cherokee for $149 a month! Ready to perform, no matter what the conditions, the 2019 Jeep Cherokee is as hungry for adventure as you are. Experience enhanced performance and improved efficiency thanks to the available 2.0L Turbo engine, while impressive all-weather capability ensures that wherever you need to go, the Cherokee will get you there. 2019 Ram 1500 Bighorn for $229 a month! The all new Ram 1500 simply has no competition. Loaded full of Best-in-Class starts and available Class-Exclusive features, it’s easy to see why the 2019 Ram 1500 is the best. With the most towing and hauling capabilities ever in a Ram 1500, as well as improved efficiency and exceptional available off-road capability, the All-New Ram 1500 has the grit to take on any task.